One of those benefits was financial stability, something Kelley was struggling to maintain while pursuing drag. Now, despite the furious operational tempo the Navy demands of its personnel, Kelley manages to find time to perform as Harpy Daniels on ship during MWR-sanctioned events designed to boost morale and provide sailors a much-needed break from daily burdens. He even took home a $1,000 Navy Exchange card for a second place finish in a recent lip sync competition. Boosting morale and spreading joy through performance has appealed to Kelley since he was a youth, he said. “I walked out of my mom doing death drops and splits,” he joked with NBC News about his knack for performance. And it turns out Kelley has an equally impressive knack for life as a sailor. “Kelley has performed his demanding duties in an exemplary and highly professional manner and demonstrated tremendous initiative and attention to detail,” the former commanding officer of VFA-115, Cmdr. Samuel Gray, wrote in the release. “He was instrumental in his administrative duties and he reinvigorated CSADD program participation, creating social and volunteer opportunities for junior Sailors." The “exemplary” sailor’s interest in drag first developed when, as a 16-year-old, he began watching the popular reality show, “RuPaul’s Drag Race.” Next came his first in-person drag experience in 2013, when his then-boyfriend took him to a show at Pennsylvania’s Bloomsburg University. The thrill, unfortunately, was not always mutual for his family. Despite the fog of skepticism, Kelley told Navy Times that his father’s concern lifted the first time he saw his son perform as Harpy Daniels at Bloomsburg University. Kelley, who was named the pageant queen in 2015′s Miss Gay Harrisburg, continues to find joy in performing drag and as a sailor aboard the Reagan. And despite the differences between the professions from an outsider’s perspective, he says his dedication to performing has only helped his efficiency as a sailor. Those similarities didn’t seem possible when he first enlisted, he said. The thought of being around so many different sailors who shared none of his flamboyance made him nervous, a fear that was quickly quelled when he was warmly welcomed by his peers. While he’s not exactly certain what the future holds, Kelley anticipates that he’ll head to the East Coast once his tour in Japan is up. There, he expects to reenlist for at least another three years to finish what he started as a sailor, he said. “I’ll just keep following my gut and stay on this path, because right now, everything is feeling just right,” he said. 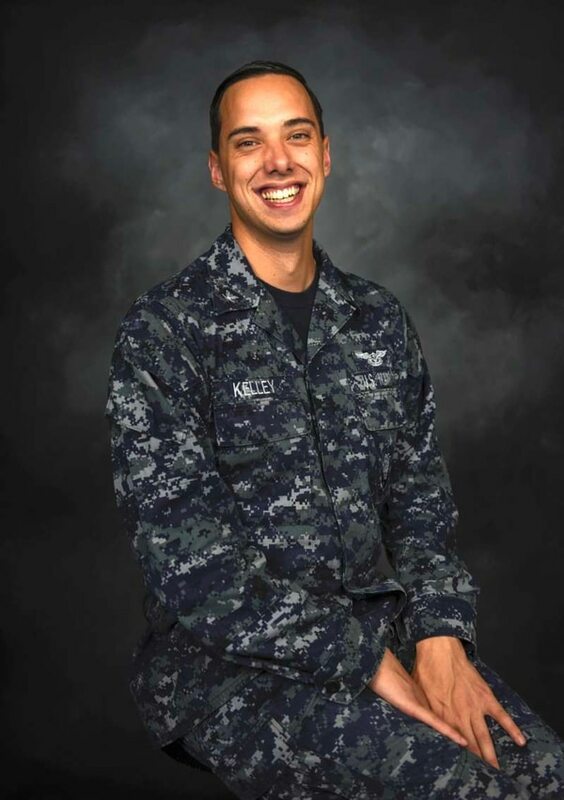 Part of that feeling for Kelley is his hope that this positive experience as part of VFA-115 will serve as an inspiration for others who may feel ostracized. “I’ve inspired many by being who I am today,” he said. “I want to show people that anything is possible and that acceptance is there. No matter where you come from, who you are or what you do, never be afraid to take a risk, have fun and be yourself. At the end of the day, we live for ourselves and should never be afraid to do what makes us happy."